We create a lot of demo applications to show the scalability of embedded GUIs designed and developed with Storyboard Suite. In previous posts, we've shared Storyboard HMI demos on Renesas RZ family processors, such as the RZ/A1. Today’s demo showcases Storyboard on an RZ/G1M. 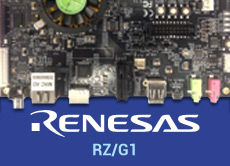 The Renesas RZ/G series of processors features high performance for rich animations and enhanced UIs that include 3D graphics and HD video. This digital instrument cluster demo built in Storyboard Suite takes advantage of these advanced UI capabilities.